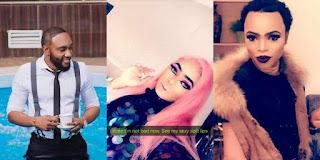 Nigerian cross-dresser and ‘slay queen’, Bobrisky, has literally begged singer Kcee of Limpopo fame to pay his bride price and marry him. 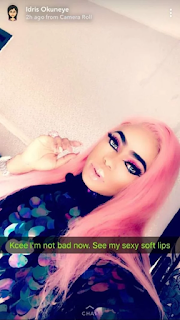 Bobrisky took to his Snapchat account to publicly profess love for the handsome singer who is married to Ijeoma Okonkwo, with kids. The ‘man-woman’ who was recently appeared on Yvonne Okoro’s popular TV show cooking with cooks and braggarts here in Ghana, gushed over the musician by insisting that he won’t stop playing the singer’s music until he walks him down the aisle. 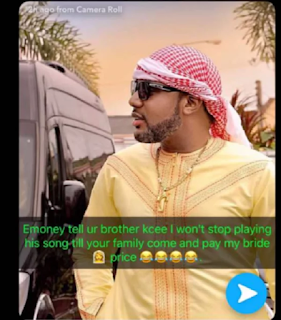 To show the extent of his seriousness, Bobrisky appealed to Kcee’s billionaire brother, E-money, to come with their family members to pay his bride price on behalf of his brother. Kcee, I’m not bad now. See my soft lips. E-money, tell your brother Kcee I won’t stop playing his music until your family come and pay my brideprice.